This entry was posted in Mandolins on June 23, 2013 by Joel. This entry was posted in Mandolins on June 30, 2013 by Joel. 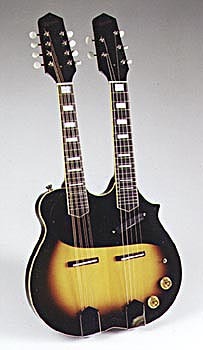 The original EARNEST octave mandolin has gone through a number of design changes and refinements resulting in OCTAVIO, a flat-top, octave mandolin featuring a strong, guitar-like bass and a sweet, balanced treble with lots of sustain. 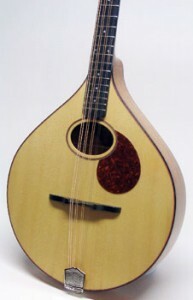 The deep, rounded teardrop shape creates a large air chamber allowing the instrument to respond to the low G strings, while the 23″ scale gives it the “feel” of a tenor banjo. OCTAVIO fills a void in the mandolin family. 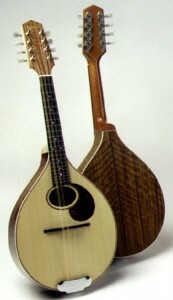 It creates an ideal voice for Celtic music, as well as other ethnic, classical, and contemporary styles. OCTAVIO is available in domestic or exotic tonewoods, with a spruce top, ebony or rosewood fingerboard (12″ radius or flat), and ivoroid binding. 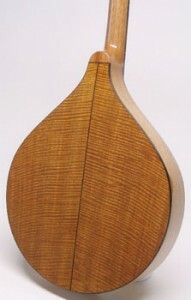 This entry was posted in Mandolins and tagged Mandolins on June 30, 2013 by Joel. Inspired by the work of an anonymous Italian luthier in New York’s Little Italy, the Passione mandolin combines an old world design with a few modern touches inlcuding a graphite-epoxy reinforced neck, 13 7/8″ scale, 10″ radiused fingerboard, X braced top, and Schaller tuners. The sound is sweet and clear, favorable for traditional, ethnic, or classical music. Available in curly maple, walnut, pear, or other exotic tonewoods, with a spruce top, mahogany or maple neck, and ivoroid or tortoid binding. With a lightweight swamp ash body and ears like a cat, the SWAMP CAT has a traditional bolt-on maple neck, rosewood fretboard, and a hardtail bridge with through-body string anchors. Available with either single coil or humbucking pickups, the SWAMP CAT has a clear, bright tone and great sustain, thanks also to the 14.5″ scale length. The SWAMP CATcomes in four or five string models with a translucent blonde lacquer finish, black or parchment pickguard, and chrome knobs. Custom colors are also available. 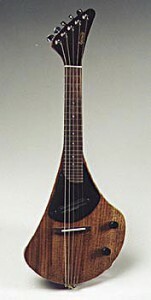 The SWAMP CAT was designed for Barry Mitterhoff, classical, ethnic, bluegrass, jazz, and blues mandolinist extraordinaire, currently touring with the band, Hot Tuna.